Action Performance Companies Inc., the leader in the design, promotion, marketing and distribution of licensed motorsports merchandise, today announced the release of a special edition die-cast replica showcasing the first special paint scheme of Rusty Wallace�s final race season � the No. 2 Miller Lite/Shootout 2005 Dodge. Wallace will debut the car during the Shootout event at Daytona International Speedway on Feb. 12, 2005. The Daytona Shootout is a precursor to the Daytona 500 that showcases the previous season�s pole sitters and past Shootout winners in a 70-lap, non-points race. As a past winner of the Shootout race in 1998, Wallace automatically qualifies for the event. In late August 2004, Wallace announced that the 2005 NASCAR NEXTEL Cup Series would mark his last season in NASCAR stock car racing. In addition to Wallace�s final season behind the wheel, he will continue growing and managing his Rusty Wallace Inc. No. 66 and No. 64 NASCAR Busch Series teams throughout 2005, taking over as a full-time owner in 2006. Action Performance Companies, the exclusive die-cast licensee for Rusty Wallace�s stock cars, will produce replica versions of the No. 2 Miller Lite/Shootout 2005 Dodge in a variety of collector scales. The car can be ordered via Action�s standard distribution channels. To reach an Action Racing Collectables distributor, call the locator line at 1-800-411-8404. Racing Collectables Club of America, the source for Action�s Elite� die-cast series, can be reached at 1-800-952-0708 or online at www.goracing.com. "For Rusty Wallace fans, the 2005 NASCAR NEXTEL Cup Series will not be long enough," said Fred W. Wagenhals, Action Performance�s chairman, president and CEO. "Showcasing a special pre-season paint scheme is the right way to begin a yearlong salute to Rusty and to honor his extraordinary career. All of us at Action Performance are pleased to be such an integral part of Rusty�s �Last Call� season." 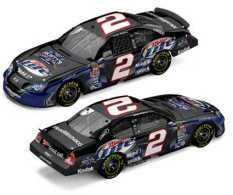 Look for additional special paint schemes honoring Rusty Wallace throughout the 2005 NASCAR NEXTEL Cup season.